With the holidays upon us and the third season of Ash vs Evil Dead right around the corner, STARZ is wishing viewers a "happy horror days" in a new blood-spattered holiday card featuring Ash and his long-lost daughter. 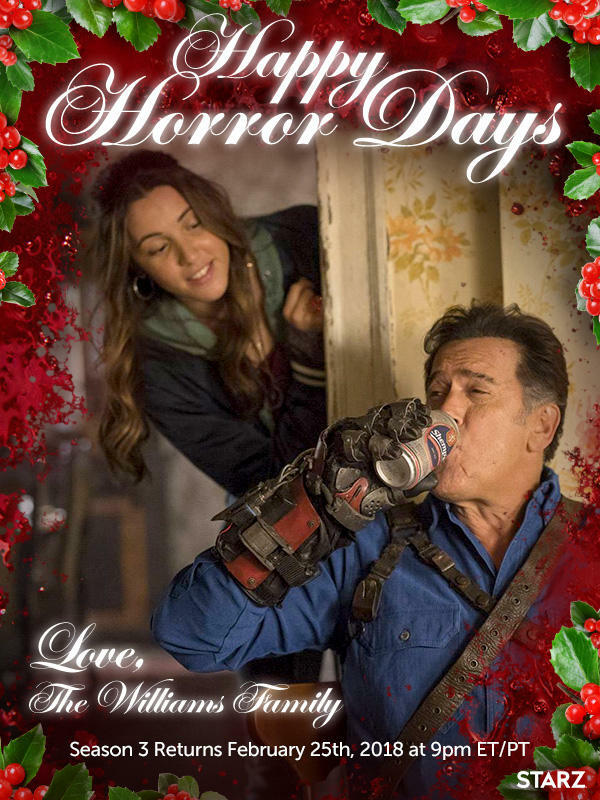 Featuring Bruce Campbell as Ash and Arielle Carver-O'Neill as Ash's daughter, Brandy, the new holiday card can be viewed below, and in case you missed it, check out photos and a poster for the third season, which premieres on Sunday, February 25th on STARZ. As previously reported by Deadline, this is the synopsis for season 3: "Ash’s status in Elk Grove, Michigan has changed from murderous urban legend to humanity-saving hometown hero. When Kelly witnesses a televised massacre with Ruby’s fingerprints all over it, she returns with a new friend to warn Ash and Pablo that evil isn’t done with them yet." Bruce Campbell will return in the third season as the boomstick king, Ash, and he will also executive produce with Rob Tapert and Sam Raimi, the director of the original Evil Dead film franchise. Also reprising their roles from the first two seasons are Lucy Lawless, Ray Santiago, and Dana DeLorenzo. As previously reported, Arielle Carver O'Neill has joined the season three cast as high schooler Brandy Barr, and we now know that the character is the long-lost daughter of Ash. Stay tuned to Daily Dead for more updates on the third season, and enjoy season's greetings from Ash and Brandy below.